AutoplayMM is a free Windows AutoPlay menu utilizing XML scripts and images. You can create your own Autorun menus by just creating a simple XML script file and a background bitmap. AutoplayMM is freeware, so you are allowed to use it without any costs, but must not modify the executable nor charge any money for AutoplayMM itself. AutoplayMM uses XML tags and and attributes to create the menu. The menu is defined by the file amm.xml . The file amm.dtd is also required, describing the structure of the amm.xml, but must not be modified. These files and additional ones, defined in amm.xml, are parsed by the AutoplayMM.exe to generate the menu. AutoplayMM.exe, amm.xml and amm.dtd must be in the same folder to work correctly. To use AutoPlayMM as an Windows Autorun menu, you have to create an autorun.inf file. You can also modify the file included in the sample download. AutoplayMM is compiled in two versions. The standard version uses standard Windows controls. The other version uses XP/Vista style controls. The following part describes the structure and attributes, that can be used in the amm.xml file. Underlined attributes are required. A good starting point is to take a look at the sample and modify it for your purpose. The <amm> tag is the general tag to declare an AutoplayMM menu and encloses all other tags. It defines the general attributes for the menu. The <window> tag follows the <amm> tag and defines a new window with all its attributes. It encloses one or more <object> tags. The <object> tag defines an object on a window and must be enclosed by a <window> tag. Currently there are two types of objects, button and image. Both can react on user events. A button is drawn using standard dialog buttons with a caption, while an image can use user-defined bitmaps, allowing you to create your own button style. The <event> tag can be executed on an <object> interaction. For example it can open a program when clicking on a button or show. The event type is defined by the type attribute. open executes the default operation, associated with the referenced meda element. This can be the execution of a program, showing a textfile or PDF, or opening an URL link in a browser. The <media> tag defines elements, that can be used by <event> tags. This can be a program executable, textfile, image or an URL. 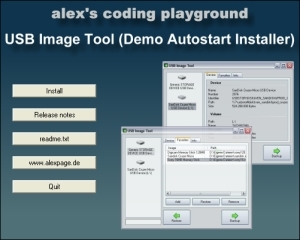 To use an URL, you must create an URL filesimilar to the alexpage.url, that is included in the demonstration menu.